To encourage, call and equip people of faith to hear and answer the cry of David, echoed in the lives of countless other aging or infirmed people, to not be forsaken or forgotten. 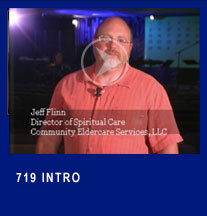 The 719 Project encourages people of faith to: Remember, Respect and Reconnect the aging and infirmed to the church and local people of faith. The 719 Project is about challenging people of faith to reclaim those who have become spiritual orphans. The 719 Project is about encouraging and equipping people of faith to grow in maturity by looking at various ways to serve people who no longer can serve themselves or the church. The 719 Project exists to encourage the connection between the younger and older generations.